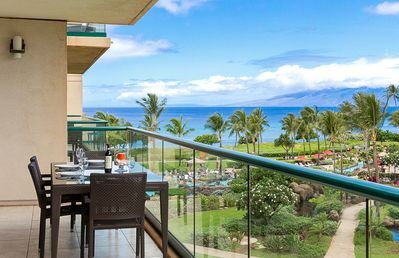 Dine on the lanai while mesmerized by the waves and beautiful tropical setting. 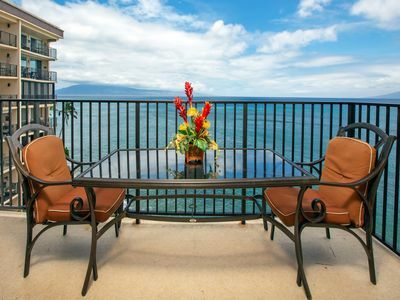 A perfect place to relax and unwind, this condo has a beautiful view of the ocean from the lanai. 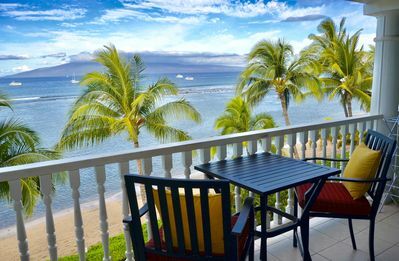 With tropical garden views and the sound of the waves in the background, relax and enjoy every minute of your vacation. 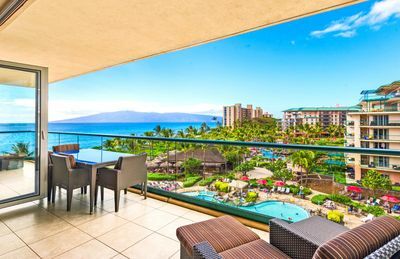 Remodelled a couple of years ago and recently many more upgrades added, this condo is tastefully decorated in contemporary, but still Hawaiian style. The kitchen has a large eating bar, granite countertops, stainless steel appliances, and fully stocked with everything but your groceries. A large dining table with lots of seating. The master bedroom having a Queen bed and the second bedroom having 2 twin beds makes it perfect for families. Also, a Queen pull-out sofa sleeper in the living room makes the unit able to sleep up to 6 persons. The bathroom has a tub/shower and granite countertops. Large TV, cable, DVD player, free wifi, air conditioner. 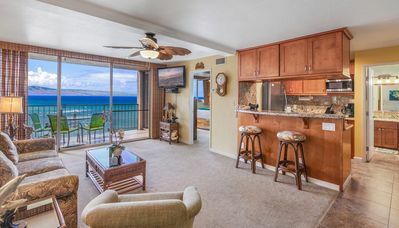 Stocked with beach towels, beach chairs and coolers for your use, this condo has all the comforts you feel at home with ultimate vacation luxury also. 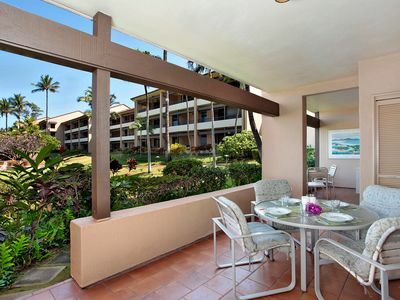 The tiled lanai has lounging chairs, a patio table and chairs. A perfect place to put your feet, relax and enjoy the peacefulness. 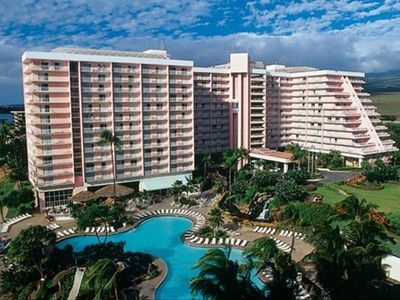 Take forty steps to the right and you are oceanfront. The oceanfront deck is a wonderfully warm gathering place to visit and watch the whales and sunsets. 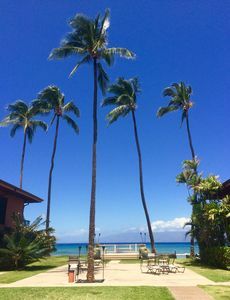 Steps into the ocean make it easy to swim and snorkel in the reefs right out front. Approximately 60 steps in the other direction you are at the pool. 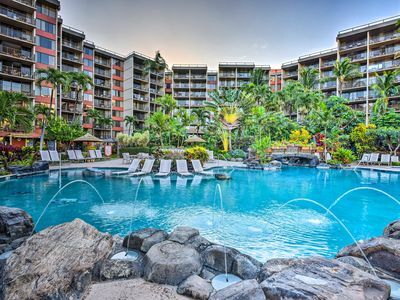 Lounge chairs surround the pool and a BBQ, ice machine and covered seating area to one side for relaxing, outdoor eating, and visiting. 3 BBQ areas are on the property and a coin operated laundry is only a few steps from the door. Large grass areas for the kids to play, this property is family friendly, yet still very peaceful and quiet. Within walking distance is a grocery store, natural food store, farmers market, coffee shops, restaurants, spa, shops and much more. Beaches to the north and south. Golf courses close by. 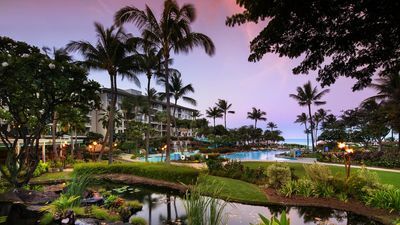 A beautiful walking/jogging pathway through the Ka'anapali area has fabulous scenery for miles. We love to go for a beautiful long walk every morning! Whalers Village is near by with lots of shops, restaurant/bars, and lovely beach. 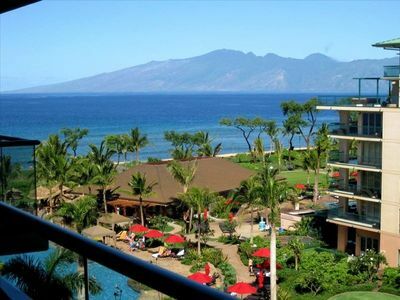 Only a 10 minute drive is our favourite town, Lahaina. It is such a lovely historic town with lots to see and do. 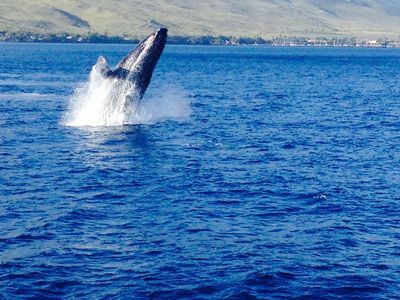 It seems to come alive at night and you absolutely must visit Lahaina. 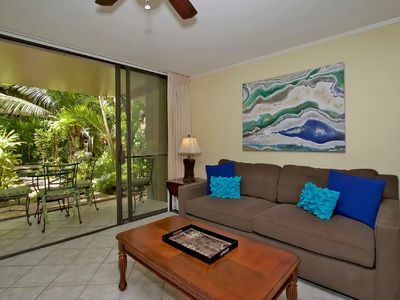 We welcome you to consider our condo as your vacation paradise! 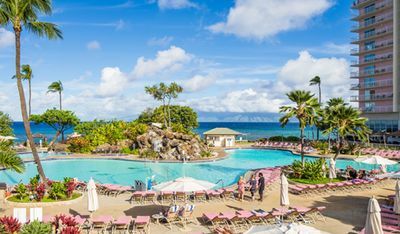 *NOTE: Due to recent hurricanes/tropical storms, the Maui Sands seawall has had some damage. The oceanfront deck has been temporarily closed while we await permits to repair the damage. There is still a large gathering area where folks can gather to watch the ocean, sunsets, whales and visit. You can still enter the ocean via stairs. 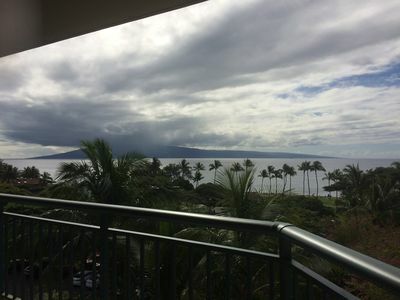 There still is a view of the ocean from our lanai, however it is slightly less due to a low fence put up to protect the area and for the safety of our guests. I have attached a photos of this area. JUST RENOVATED! 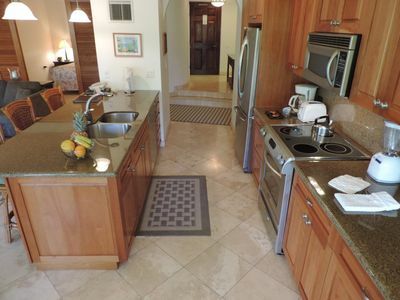 Fully equipped condo! Pride of ownership & steps to the beach! 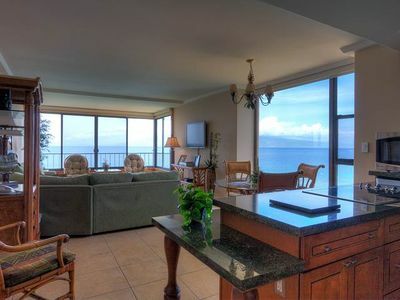 EXCEPTIONAL OCEANFRONT MAUI CONDO - SUMMER SALE - $145.00 A NIGHT! 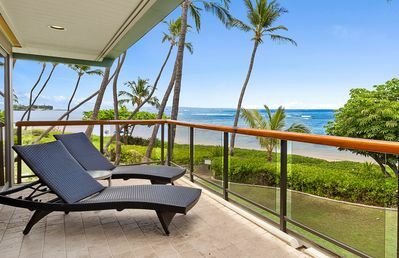 OCEANFRONT LUXURY - Completely remodeled with amazing ocean views! 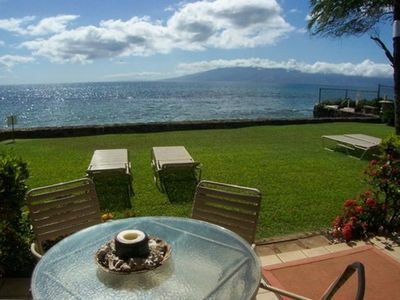 West Maui’s Hidden Beachfront Gem – Puunoa Beach Estates – Sweeping Oceanfront Views and 5 Full Bedrooms! 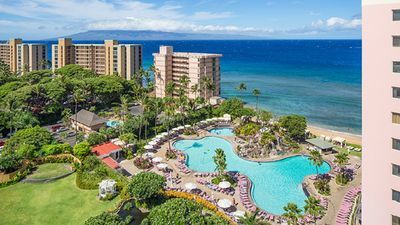 1 BDRM MOUNTAIN VIEW CONDO~ KA'ANAPALI BEACH CLUB~ PARADISE AWAITS! GREAT VIEWS!